Today's post is the fourth in the series and features responses from Jeffrey Ladd of Errata Editions. Already published are responses from Michael Itkoff of Daylight Magazine and Ray Potes of Hamburger Eyes. fototazo: What is the backstory on how Errata Editions formed? Jeffrey Ladd: Back in 2008 I conceived of the idea of a series of books about rare photobooks that are mostly inaccessible to students. I find it absurd that most of the greatest books the medium has produced over the past 150 years are essentially unavailable to students and newer generations of photographers. Books were incredibly important to my own maturity as an artist after school and although I was lucky in the mid-80s to acquire many long out of print books that are now considered important, there were always more that I couldn't see, let alone afford. Over the past twenty-some years I have met many artists in person and have suggested to them that they reprint their older books for posterity and most said they don't want to. That is why I conceived of the series not as traditional "reprints" but as "studies" of older books. Some people don't seem to understand that an artist might not want to reprint a book they did 30 years ago and in turn misunderstand why we don't do reprints with Errata Editions. In 2009, I told my friend, the photographer Ed Grazda, about my idea of the series and he suggested we start a small publishing company with his partner Valerie Sonnenthal – thus Errata Editions was born. The basis of the company would focus on establishing the Books on Books series and if we happen to have money for other projects, then we would do those as well. With the green light and financial backing I started approaching artists about being a part of the series, and surprising to me, almost everyone has agreed so far. f: What is particular or unique about the books Errata Editions publishes? JL: Well, what is unique is that a series like ours has never been done before. Perhaps because the thought of navigating the various complicated copyright issues has prevented anyone from even wanting to start. It is very complicated to track down all of the rights issues, especially in regard to books that are over 70 years old, but that becomes one of the interesting aspects for me personally. It's like detective work into the history and creation of great books that I admire. f: What is your process for deciding what to publish in the series? JL: There are a few basic criteria for inclusion in the series; the book has to be out-of-print and inaccessible – generally because they are now too expensive; it has to be a book that the artist or estate does not want reprinted in a traditional contemporary edition; it has to be a book that has been widely recognized as being important to the history of the photobook; and lastly, the artist or estate has to be open to granting the rights for our study. Beyond those few criteria, I try to have the four books we publish each year make sense as a set. The four books might represent four different attitudes towards "documentary" photography (Books on Books #1-4), or four different descriptions of cities (Books on Books #5-8) or photographers describing people waiting (Books on Books #9: Paul Graham's Beyond Caring and Books on Books #10: Zdenek Tmej's Alphabet of Spiritual Emptiness) or artists pushing the boundaries of description (Books on Books #11: Alexey Brodovitch's Ballet and Books on Books #12: Laszlo Moholy-Nagy's 60 Fotos). These are links that the reader might make or not, but they are there and open for the discovery. Since we are not starting from the beginning of the photobook history with Anna Atkins books of botanic studies or Henry Fox Talbot's Pencil of Nature, but instead combining classic and contemporary bookworks, it seems necessary to make those connections between past and present. Of course, history books like the Parr/Badger volumes inform us to what is out there but there is also a subjective side to the choices - that is - what we think is interesting and important for discussion. JL: Thinking of photography books or visual art books in general as a profitable market has a pretty dismal historical business record from what I can see. Most art or photobooks lose money for the publisher. They are expensive to produce and the profit is laughable compared to a genre like fiction. For every Alexander McQueen catalog that finds its audience, there are tens of thousands of visual art books that don't. The newer market place of less brick and mortar bookstores and Amazon.com taking the lion's share of business makes it more difficult for everyone involved. Sure, my books sell well on Amazon and I appreciate that, but my series has to be as physically visible in stores for people to discover. JL: The highlights for me are working with artists I have admired since art school. 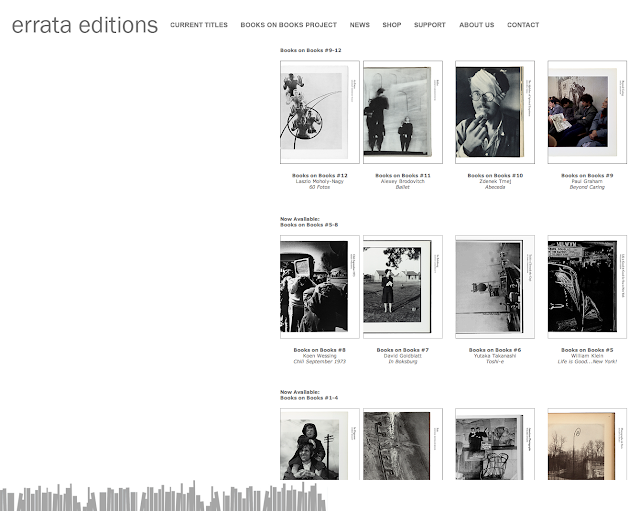 If you had told me twenty-five years ago that sometime in the future I would be sitting with William Klein in his Paris apartment talking over the book we were about to publish, I would have laughed - the same goes with Chris Killip, David Goldblatt, Sophie Ristelhueber, Paul Graham, Yutaka Takanashi and the others. f: What is next for Errata Editions? JL: We are publishing four books a year in the Books on Books series and will continue to do so as long as we can fend off bankruptcy. One of the longer term goals of Errata editions is to form a 501(c)3, not-for-profit foundation that would enable us, through tax deductible donations, to give our books away to art schools and public libraries for free. We believe that the history of printed matter in photography is too important to disappear and we'll do our best to keep some of it visible.